Over the past few months I’ve been spending a little bit of time here and there with Ed at a little shop in Knightstown called Bull Dog Ink. Now, you may be wondering WHAT the above is. Well, I’ll tell you what it was suppose to be. Warning, even what it was suppose to be is extremely stupid. 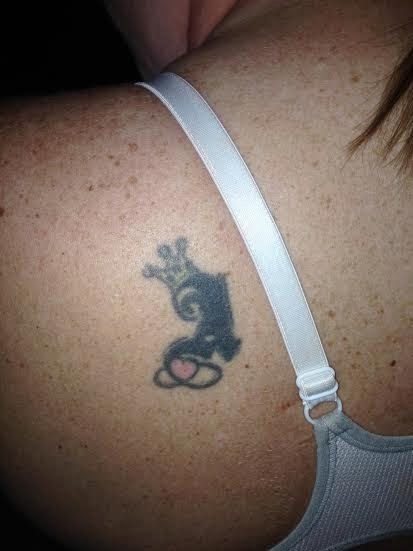 I wanted a capital letter A (gothic style) with a princess crown on top and a heart at the bottom. Incredibly stupid. Dumb. Childish. Stupid. I was getting really sick of answering that question. I wanted to make it something meaningful. I thought about it for years….YEARS! Which, by the way, is exactly what you should do when thinking about a tattoo. This was my 5th tattoo which covers up my 2nd tattoo. My first one I thought for several days about. (probably not long enough but I still love it….) My wrist tattoo I thought for a long time on and my foot tattoo the same. I love my tattoo’s and believe it or not, my guy has none. He has no desire for tattoo’s and still loves me. If I can give any advice to my children or the youth of America in reference to tattoo’s it would have to be THINK ABOUT IT. Be absolutely sure you want it, you are okay with the location of it, and you’re good with it being there forever. I may definitely regret mine when I’m old and they sag and wrinkle and look disgusting…who knows. I’m not too worried about it at this point. I don’t encourage children to get them. In fact, most of mine are completely hidden at my job. Even if they are seen, they have nothing to do with my “work performance” either and some people will certainly disagree with that. I officially love ALL my tattoo’s because I made a big change. They all have heart felt meaning and are filled with memories. For this, I am grateful. I contacted Ed at Bulldog Ink and told him that I wanted to cover up this mess with a collage of things about my mom. I mentioned that we both played piano and loved music. I mentioned that I loved when she planted bleeding hearts. It was one of our favorite plants. I mentioned that she loved tulips in the spring. I mentioned that her and my father’s wedding flowers included stephanotis. I also mentioned that everytime I saw a butterfly I felt like it was her watching over me in some way. I also mentioned the same thing about cardinals…every time I see one I swear it’s my mom. So he sent me this drawing and I just about died…. Just seeing the rough draft I was floored. It was exactly what I wanted, and more! YES, it hurts! Some of it is more painful than others. I think it is different for everyone. I hate any location near my neck or spine. On my foot it was the side of my foot that was worse than the top. Like I said, probably different for everyone. I’ll admit. After the appointment was over I was a little worried about how that lovely little A was actually going to cover up. I had faith in Ed, but it was hard for me to picture. You’ll see he’s basically a tattoo genius because he had the eye and totally knew what he was doing. 3 or so weeks of healing and I went back for round 2. Round 2 actually wasn’t that bad at all. In fact, I got a ton of online shopping done for Christmas. I read several chapters in my book. I just chilled for about 3 hours while the needle hit my back. The above photo doesn’t really give it the justice it deserves. The greens were and are so very bright. The shading is incredible. The piano keys obviously came to life and I was amazed! Over 4 weeks later I went back and was looking forward to hopefully seeing the end result. I wasn’t sure if another 3 hour session would get it done, but I was happy to sit that long if it did! This time was definitely more painful than the second session. 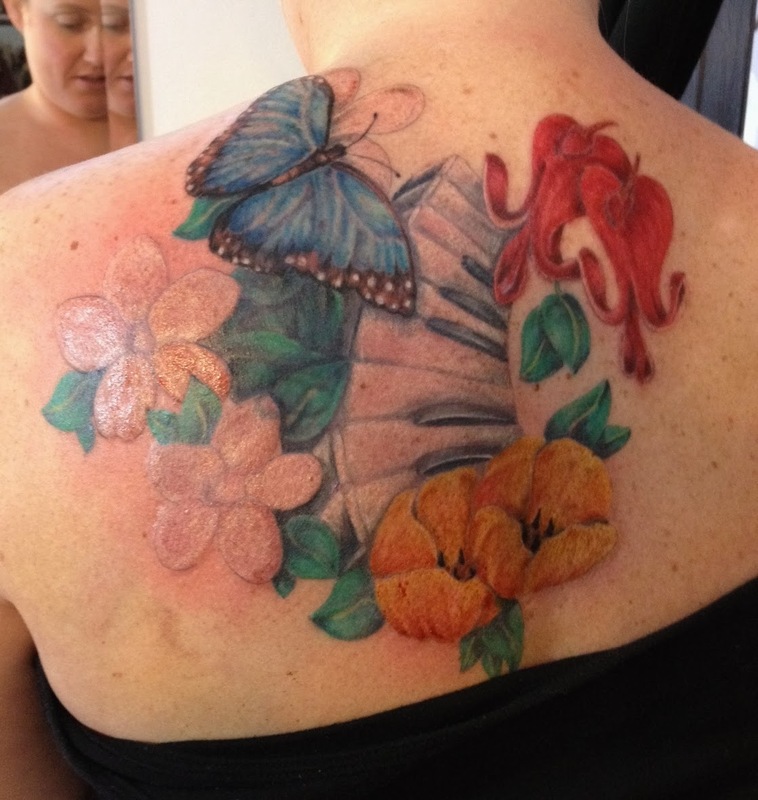 The bleeding hearts below my neck….ouch. 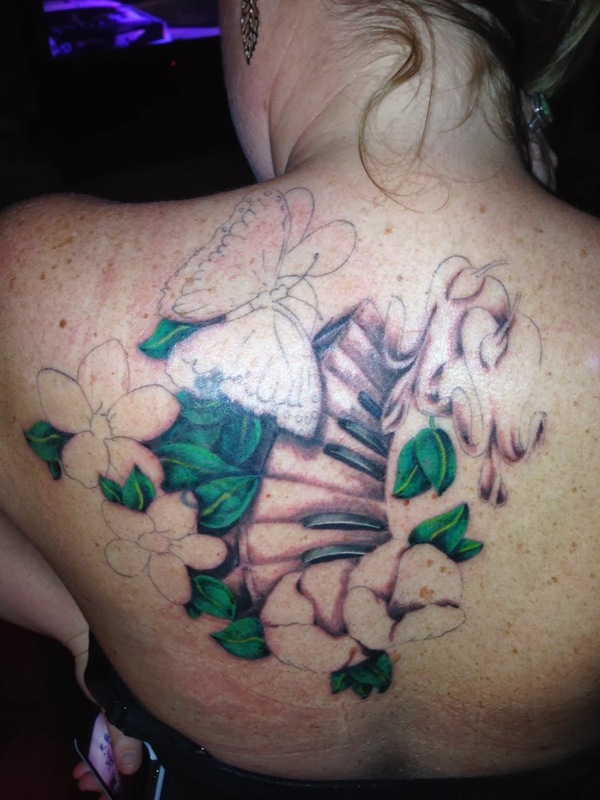 The tulips down there on my spine….ouch. The butterfly was not nearly as bad as I thought. Still, I feel like a champ. I read about 12 chapters in my book. Stalked people on social media. Chatted with Ed a bit…and let him do his thing. And you can’t even tell what was there before. That makes it even better! 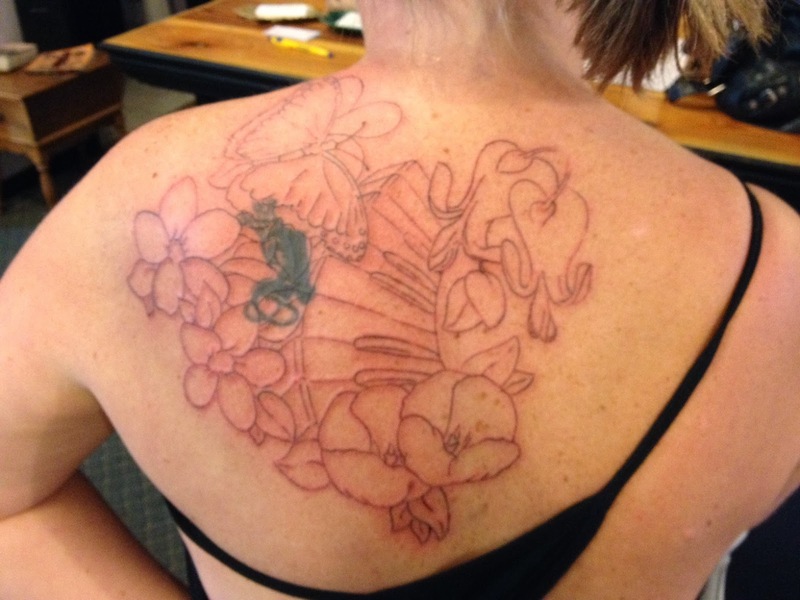 The red flowers are the bleeding hearts…..the flowers I always begged my mom to buy and plant in our flower beds. The yellow tulips because she loved them so much. The white (somewhat bleeding in the above pic….very fresh!) flowers are stephanotis and were a part of the bouquets in my mom and dad’s wedding. I’ve seen pictures and still have their wedding announcement which is WAY more detailed than what we have today. The butterfly because she is always with me, but I feel it most when I see those. The piano keys because music was a connection we will forever have. When I sit down to play, even now, I think of her and sometimes cry. I know playing piano made her proud because she loved to play herself. I know she loved to hear me play. It was and still is a huge part of my life and a part that makes me think of her. There is no cardinal on this tattoo even though I wanted one. 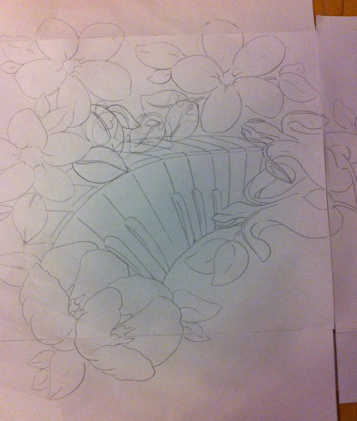 Ed basically told me that to look correct the cardinal would have to be GIGANTIC in relation to the flowers to make sense and although I love cardinals…I don’t think I want a huge one on my back with an already large back tattoo. Maybe another one….maybe next time.,…..maybe not. Some people say tattoos are addicting. I wouldn’t say addicting. I just think for people who like to express themselves it is a way of doing so. It’s a way for me to permanently display the things that I love and who I am. I’m pleased, to say the least, with my tattoo. It is incredible and I’m so very blessed to have met someone with amazing creativity. I have tried to enter this comment three times and keep messing something up! What a beautiful tattoo, beautiful meaning, and great cover up. I always appreciate a great artist and he obviously is one. Bleeding Hearts actually make me think of my Momma too 🙂 That is certainly a tattoo to be cherished and just BEAUTIFUL! I would love to see it in person! Thank you so much Leah! I have such a hard time commenting on others blogs as well. Sometimes it takes several attempts. Not sure why! Thanks again for the love. Keep writing! I love your blog!